Growing up there were two major media events that made an impression on me, the O.J. Simpson trial and the Clarence Thomas Senate committee hearings. These were major events because it was perceived that prominent African-American men were having their characters assassinated…or at least that was the perception at the time for many in the African-American community. In the case of Clarence Thomas it was more than that, it was a battle of the sexes. A classic he said she said battle that felt more like a legal trial than a hearing designed to investigate and uncover the truth. As the woman who brought sexual harassment into the national spotlight, Anita Hill was painted as a villain by several in the media. Though her testimony against Clarence Thomas was deemed shocking by some, there was no denying it had legal ramifications that are still felt today. 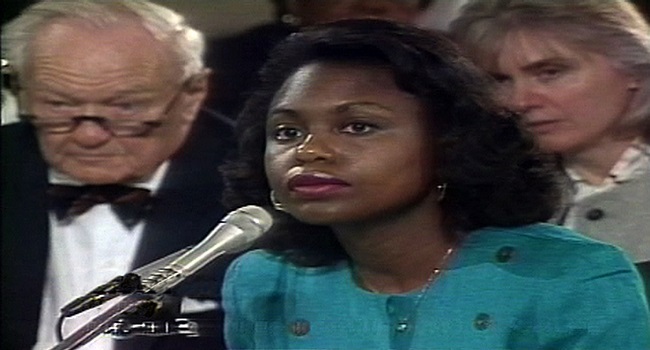 Twenty years later, Anita Hill opens up about the grueling nine-hour session and how it changed her life forever. A year after G-Dog played Hot Docs, Oscar-winning filmmaker Freida Mock returns with Anita. A film that attempts to examine the real woman behind the testimony. Mock’s film is framed in such a way that it offers a look at the allegations, and subsequent hearing, of then-Supreme Court Justice nominee Clarence Thomas through Anita’s eyes. The majority of the Senate committee hearing footage in the film is from Hill’s testimony, with only a few strategic scenes of Thomas to emphasize how he portrayed himself to be the real victim. The film highlights the double standard that occurred as most of the things Thomas was claiming he was a victim of, such as racial persecution, applied to Hill as well. The only difference was that he was a man and she was a woman. Mock offers insight into how the constant media attention impacted Hill’s work and role as a professor. Although she did not ask for the spotlight, Hill channeled the experience, good and bad, and became a voice for women everywhere. She openly shares her story with women of all ages, and is now a symbol of strength and action. Anita is a film that feels like a well deserved tribute to a woman who unintentionally changed the way society views sexual harassment. While a solid film, Freida Mock’s Anita tends to be a little overly gushy at times. The last act in particular feels like a “thank you Anita” tour. Despite this, Mock succeeds in making a film that will cause many to look at the history of the hearings in a brand new light. Anita is a film that both honours Anita Hill’s legacy and inspires women and men to stand up against all forms of sexual harassment.